Some girls can search a lifetime to find her favorite and 'the-most-perfect' accessory but I'm happy to tell that I found mine 3 years ago, somewhere in a small town in Holland. I called him Pijo and he's the cutest and most beautiful little pug on the planet. Same as his mum he likes dressing up. 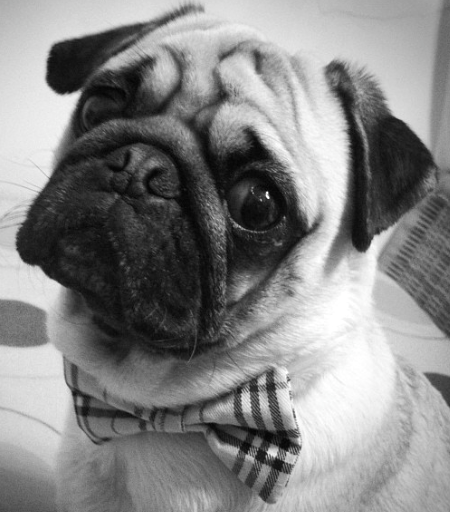 I got him some shirts, jumpers and nice collars but his favorite is the Burberry bow tie. Once I put it around his neck he's prancing around and showing off to others. Not only I can see how lovely and sweet these pugs are. Even the big fashion companies spotted this dog trend. H&M is selling Pug T-shirts and sweaters, Topshop sells Pug accessories and last but not least, at Asos you can buy Pug onesies. Every time when see some of this amazing Pug stuff i'm willing to buy it but there is only a small problem. I don't want to look like these crazy breeder people, wearing dog T-shirts surrounded and licked in the face by their pack. Is it just me or do you think the same? Can I handle a cool Zara Pug T-shirt while I'm strolling around in town with my Pijo? Or is that a bit to much?